Presenting a handcrafted cross of Malta or Maltese cross Christmas tree ornament with authentic Swarovski rhinestones. Makes a perfect gift for firefighters or motorcycle enthusiasts. Choose from 13 assorted solid colors when you add the item to your cart. Make sure you view our other religious ornaments. 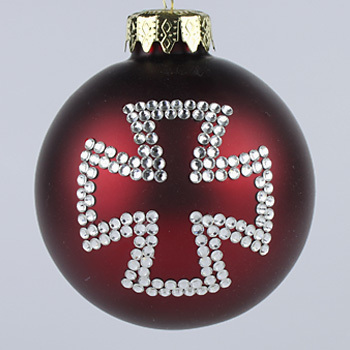 Decorative Maltese Cross and Cross of Malta Christmas tree ornaments made with genuine Swarovski rhinestones can be purchased at Designer Ornaments.